In stock -This product will ship today if ordered within the next 14 hours and 32 minutes. D-Ribose may help in supporting and maintaining energy levels. Our High Quality D-Ribose (as featured on This Morning) may support and maintain cardiac energy levels and support cardiovascular metabolism. D-Ribose may also play a role in supporting and maintaining energy levels and energy recovery after exercise. Not all D-Ribose is the same, make sure you choose a high quality product to maximise the benefits. D-Ribose is an essential pentose (5-carbon) sugar utilised by the body to synthesise DNA, RNA and produce energy. (Ribose is a "sugar" distinct from glucose. It does not raise blood sugar levels). D-Ribose is a fundamental building block of adenosine triphosphate (ATP - the substance in which the body stores intracellular energy), the preferential source of energy for skeletal muscle and heart tissue. Our High Quality D-Ribose may support and maintain cardiac energy levels and support cardiovascular metabolism. D-Ribose may play a role in supporting energy recovery after exercise. Exercise increases free radical production in muscle tissue. D-Ribose may strengthen and support the body`s crucial antioxidant defenses. 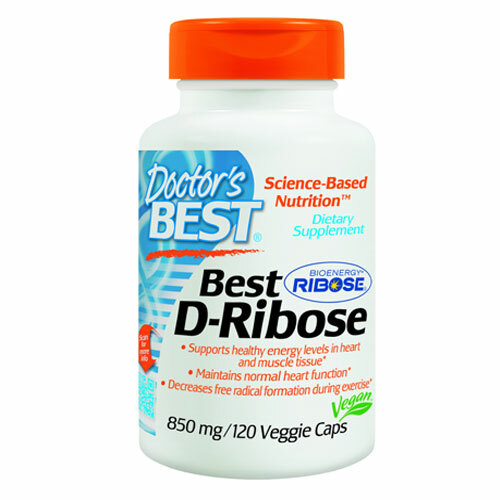 D-Ribose supports normal heart function. Optimal heart function requires a consistent supply of essential cofactor nutrients including CoQ10, D-ribose, L-carnitine and Magnesium. Modified cellulose (vegetarian capsule), magnesium stearate (vegetable source) and silicon dioxide. Does Not Contain: milk, egg, wheat, gluten, corn, sugar, sweeteners, starch, salt, or preservatives. Adults: Take 5 capsules twice daily. The product may be taken with a carbohydrate-containing meal or beverage if blood sugar fluctuation issues exist. May be taken with or without food. 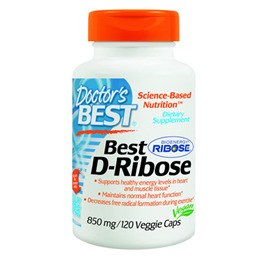 Continued use is necessary to maintain the benefits of Best D-Ribose featuring BioEnergy Ribose. Insulin-dependent diabetics, pregnant women and those with elevated uric acid levels (associated with gout) should consult their physician before use. Below are reviews of Best D-Ribose - High Quality - 120 x 850mg Capsules by bodykind customers. If you have tried this product we'd love to hear what you think so please leave a review. Our High Quality D-Ribose may support and maintain cardiac energy levels. D-Ribose may also play a role in supporting and maintaining energy levels and energy recovery after exercise.